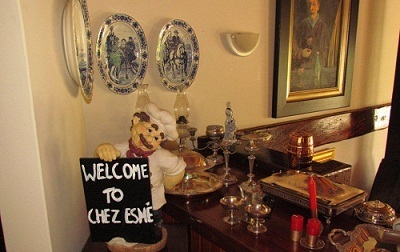 CHEZ ESME is a 4 STAR, deluxe, boutique guest house on the West Rand of Gauteng.Situated on Confidence Reef with beautiful views and sunsets. Chez Esme is strategically situated with easy access to National Roads and nearby Shopping Malls, centres and hospitals,( ea Flora, Wilgeheuwel, Constantia ). Our 5 rooms are spacious and elegantly decorated with paintings and wooden furniture spesificly made for our guest house. Every room has a private entrance open on abalcony with beautiful views. Dinner will be served on request. Area mobile CCTV and Surveillance Unit 24/7.